There are times when a user is required to choose a file to upload into an app. There are many places from which to upload files: local storage on the device, Dropbox, Google Drive and other services. In this tutorial, you will create an app that will authenticate a user with Google, launch Google Drive, and then allow a user to choose a file. Once the user selects a file, the app will download and open it. The Google Drive SDK is used to connect to a user’s Google Drive files. This tutorial will focus on allowing a user to choose an existing file, download it and display it through the app. You will use Google Drive’s built-in file picker, which will allow us to choose any file that is on the user’s Google drive. Note: If you’re new to Android development or the Kotlin language, it’s highly recommended that you start with Beginning Android Development with Kotlin to learn your way around the basic tools and concepts. Make sure you have Android Studio and the Kotlin plugin installed before you begin. 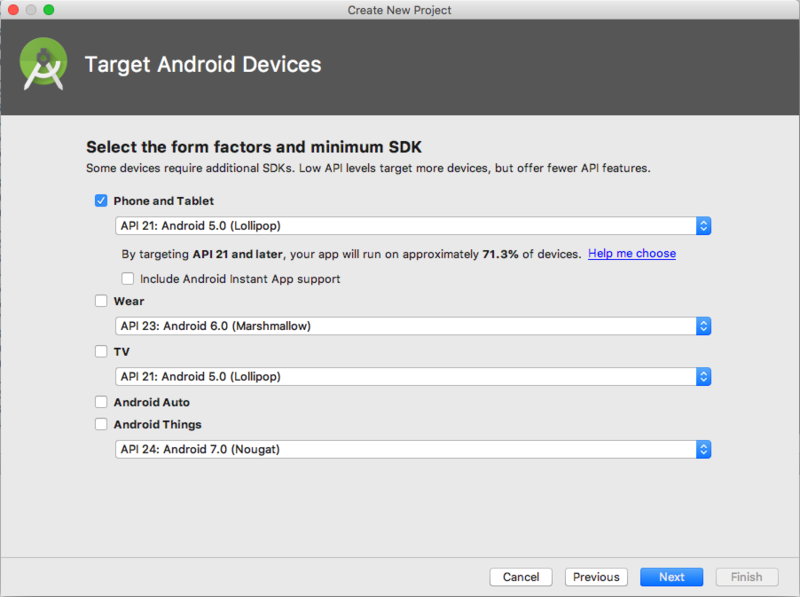 To install Android Studio go to developer.android.com. Your phone or emulator will need up-to-date Google Play services on the device to run the app. 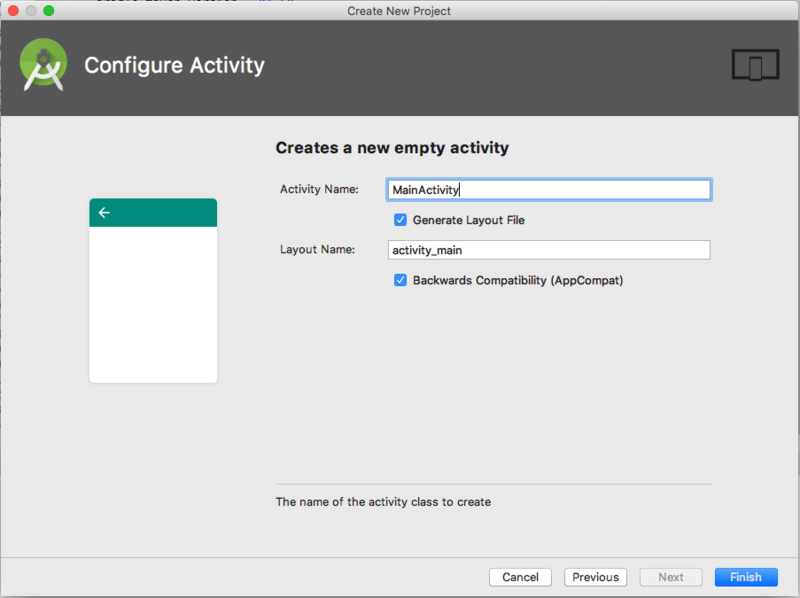 Since your UI will be bare-bones, open up Android Studio 3.1.1 or later and create a new project. 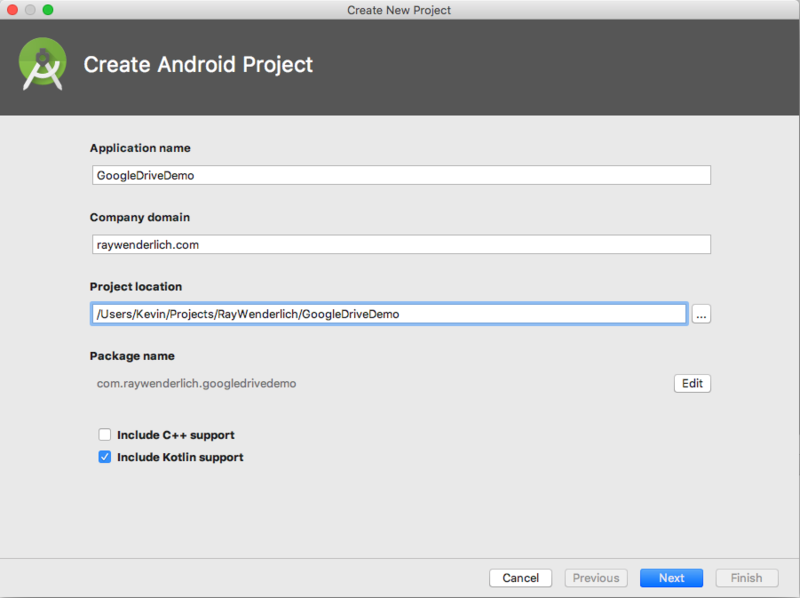 From Android Studio, select Start a new Android Studio project from the startup screen or New Project from the File menu. Enter the name GoogleDriveDemo, your company domain (or example.com if your wish) and a project location. Make sure that Kotlin support is selected and then press Next. You shouldn’t need to change anything on this screen. Just click Next. Select Empty Activity and press Next. In order to use the Google Drive SDK, you need to enable the API in your app. Go back to the Android app and you can start adding settings and code. The appcompat library contains all of the compatibility classes that help you write code that works on many versions of the Android OS. The design support library is used in this tutorial to display a Snackbar message. Next, add the libraries for the Google Drive SDK and the Okio library from Square for downloading files. If you command-click (or Ctrl-click on PC) on the @integer/google_play_services_version you will see that it takes you to the play services values file that let’s the Google Play SDK know which version you are using. Next, you’ll create a FileProvider. This is required for Android 8.0 Oreo and above to access local files. First, create a new directory by right-clicking on the app/res directory and selecing New ▸ Android Resource Directory. Name it xml. Right-click on the xml directory and select New ▸ File; name it provider_paths. This sets up your app to use Android’s FileProvider class to handle local files as urls instead of as files. This is a security restriction that Google has implemented. The first string is for the Google Drive’s activity title, and the rest are for the UI. If everything works correctly, you should have a basic UI with three buttons and a status message at the bottom. If the project does not compile or something goes wrong when running, compare your work with each of the steps above. You may need to choose Option+Return on macOS Alt+Enter on PC to pull in the import for the File class. loggedIn(): A user is successfully authenticated. fileDownloaded(file: File): A file is selected and downloaded successfully. cancelled(): A login or file selection is cancelled. handleError(exception: Exception): There is any error. This interface will be implemented by MainActivity and used by a service as a way to let the user of the service know when something has happened. This class contains the title that Google Drive will designate as the activity’s title and the mimeTypes that determines which file types to show. The class is not an Android Service, but instead acts as a service for MainActivity. You will be adding the following code, in order. const val TAG = "GoogleDriveService"
Scopes are Google Drive’s set of permissions. Therefore, by giving a file and an app folder scope, you tell Google Drive to let you handle files and folders. 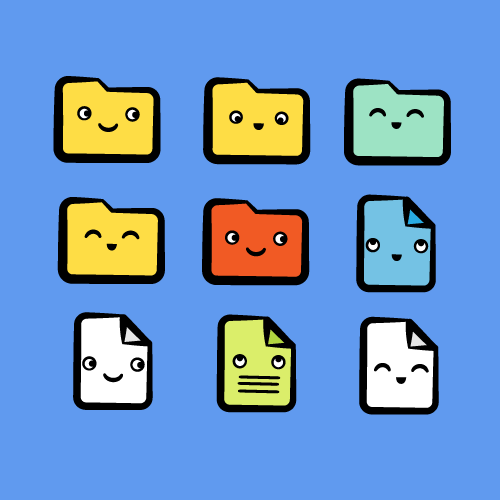 The mime types are for the type of files you want to allow the user to pick. If you want the user to choose images, you would use image/*. Here, you pick .pdf and .doc/.docx files. You also have two request codes to use for handling the result of signing in and picking a file. The TAG constant is used for Logging. serviceListener is the listener of your service. driveClient handles high-level drive functions like Create File, Open File, and Sync. driveResourceClient handles access to Drive resources and/or files. signInAccount keeps track of the currently signed-in account. googleSignInClient is created when needed and includes the scopes defined earlier. The last statement returns the GoogleSignInClient. In the method, you call helper methods or the serviceListener depending on the requestCode. You can check the result against the presence of data instead of resultCode. If no data is returned, it means the user cancelled the action. Once the user has signed in, you handle the result in initializeDriveClient(). This will create your drive clients. It also notifies the listener that the user has successfully signed in. This function gets the driveId from the intent options and passes that ID to another helper method downloadFile(). The key aspect of the whole service is downloading the picked file. To do that, you need to get an input stream to the file and save it to a local file. You will use Square’s Okio library to easily take that stream and save it to a file. There’s a lot going on in this method. Notice the getMetaData() call. That is needed to get the name of the chosen file. You are then saving the file to your app’s internal download folder (which is not visible to the user), then alerting the listener about the downloaded file and where to find it. * Prompts the user to select a text file using OpenFileActivity. * @return Task that resolves with the selected item's ID. You set the mime type and title, and then set the starting folder if driveId is provided. Then call pickItem with those options. This will start Google Drive’s File Picker activity, which will call your onActivityResult with the user’s response. Finally, add a method to allow a user to log out. Now, you will turn your attention back to the MainActivity. status, start, logout, and login are the ID of the views you created in activity_main.xml. You should be able to import them using Option+Return on macOS Alt+Enter on PC as long as you have apply plugin:'kotlin-android-extensions' in the app module build.gradle, which new projects do by default. Creates the service with your title and the document mime types. Sets MainActivity as the listener. Changes the state to logged-in if there is any logged-in account present. Sets the button click listeners. There are three buttons: Login, Pick a File and Logout. Updates views based on the current state. The code inside loggedIn(), cancelled(), and handleError() are pretty straightforward. They update the UI and/or display messages with Snackbar. In fileDownloaded(), a file is received; subsequently, you want the system to open the file. This is where the FileProvider information you put in the AndroidManifest.xml file comes in. In Android 8.0 Oreo and above, you can no longer open file:// url’s, so you need to provide your own FileProvider for that. You don’t need any other code than this. MimeTypeMap is a system class that has a few helper methods you can use to get the file extension and mime type from the url. You create an intent and make sure that the system can handle it before starting the activity — the app will crash otherwise. Time to give it a try! Build and run the app. You will first be presented with an account chooser. After you’ve chosen an account, you’ll need to give the app permissions to access your Google Drive. Once you select a file and press Select, the download process will start. After the download is complete, you should then see the file you picked automatically open in a system viewer. 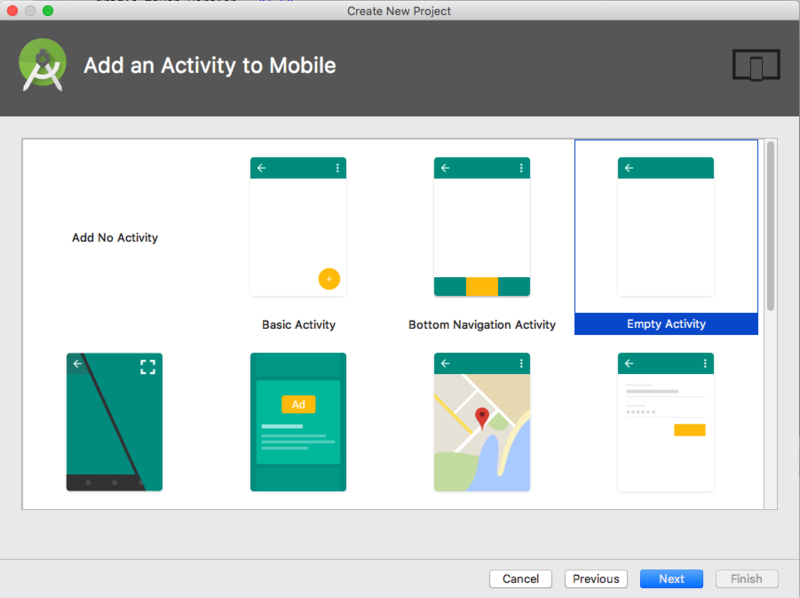 In this tutorial, you have learned how to integrate your app with Google Drive and how to download a file. Congratulations on successfully downloading files from your Google Drive! You can download the final project by using the download button at the top or bottom of this tutorial. You can do much more with Google Drive. Try, for example, adding more capabilities to your app, such as creating a file or deleting a file. Check out the documentation about other Google Drive SDK features for Android. If you have any comments or questions about this tutorial or Google Drive SDK, feel free to join the forum discussion below! Previous articleautomated testing – How to Incorporate the Defunct PageFactory in Selenium with C#?